Craving a good night’s rest? Hospitality company Cuckooz and bedroom furniture brand Simba have created the "Womb Room", a space that promotes REM sleep by simulating the prenatal experience. The peach-coloured home away from home, which is part of Cuckooz’s recently outfitted Zed Rooms – a series of serviced flats shaped to improve guests' wellbeing – was created by Studio Stilton and is located a stone's throw from Spitalfields Market. 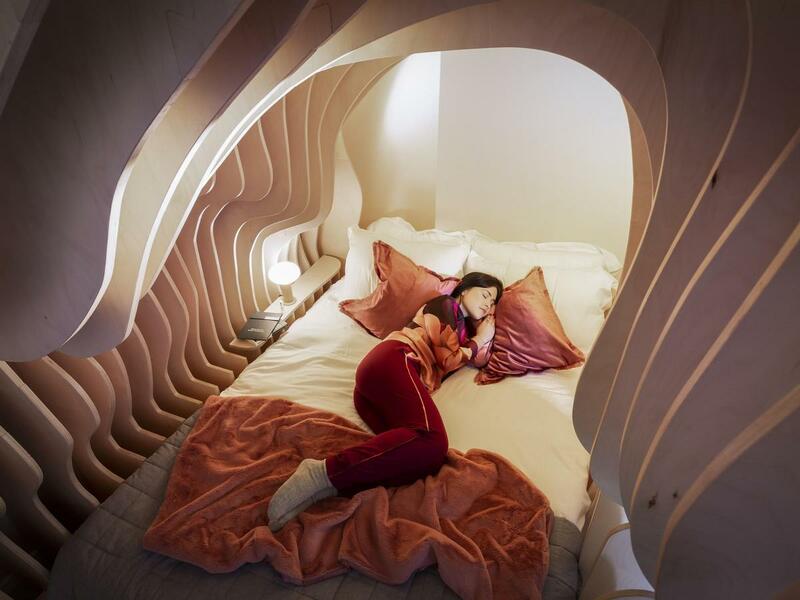 In their description of the project, the designers said the Womb Room was based both on "the most popular foetal sleeping position" and the "rib cage". Other amenities in the bedroom include yoga mats, books, sketch pads, and circadian-friendly curtains. In a statement, Simba's "resident sleep psychologist", Hope Bastine, commented: "Scientists recognised the 'first night effect' over a decade ago, where one half of the brain unconsciously acts as a 'night watchman', staying more alert when in unfamiliar surroundings. "With this in mind, tapping into the emotional and physical, no stone has been left unturned trying to soothe the effects of this in the design architecture of our new cutting-edge sleep retreat." Co-founder of Cuckooz, Fabienne O’Neill, added: "We strive to be at the forefront of innovation within the hospitality sector and to push the boundaries when it comes to guest experience. "Design and wellbeing are at the heart of everything we do. We believe our homes should be more than an apartment.'" Craving a good night’s rest? Hospitality company Cuckooz and bedroom furniture brand Simba have created the "Womb Room", a space that promotes REM sleep by simulating the prenatal experience. The peach-coloured home away from home, which is part of Cuckooz’s recently outfitted Zed Rooms – a series of serviced flats shaped to improve guests' wellbeing – was created by Studio Stilton and is located a stone's throw from Spitalfields Market.